The Arc Series further explores the artist's interest in geometric forms. He is known to find pleasure in "a good arc." 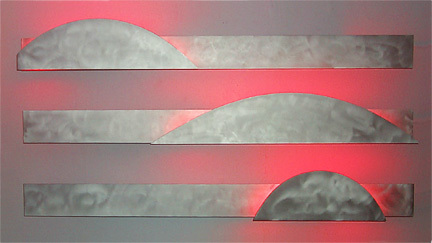 Reminiscent of the horizon at sunset, these pieces promote a sense of tranquility. Shown here mounted vertically above one another, a horizontal display of the three sculptures would work well also. The pieces are available individually as well as a series.